Break Hill was a small rope tow area that operated in West Newbury, MA, with just a rope tow and one slope and one trail. It was located behind the Hale's Dog House hot dog stand and across the street from Pentucket Regional High School. The area is totally grown in today, but some slight lift remnants have been found. Several NELSAP readers remember this area. Thanks to Paul Geoghegan for taking pictures of this area. 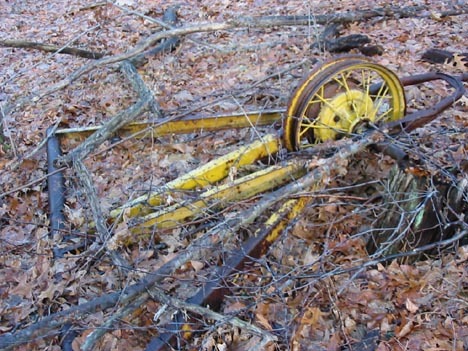 Bruce Jordan: In the early 50's there was rope tow on Break Hill in West Newbury, MA. There was one lift-line slope of some severe vertical configuration and a trail, of sorts through the woods. At the bottom of the hill there was a pond and the Break Hill Ski Tow lodge building. In the wintertime the pond was a large skating rink. The pond also served as a run-out for the hill, as there was no run-out from the hill. I remember the hill as a kid and eating hot dogs at Hale's Hot Dog Stand near the hill. But, I remember the hill l mostly for the summit water tower that a couple of us attempted to paint the class number of 59 on, it as we were in the first graduating class from Pentucket Regional High School. The hill is across the street from the school complex on Rt. 113. The property was owned by an Al Macy. Today it is overgrown to the extent that you cannot even see the water tower from Rt. 113 any more, but the on-line Terra Server maps reveal some scars. Break Hill in the 1950's, courtesy of Jeff Parino. Note the open slope with scattered trees, with the rope tow up the middle. Click on the image for a larger version. A view of the old liftline depression, taken by Paul Geoghegan. Notice how totally grown up the forest is around this former area. 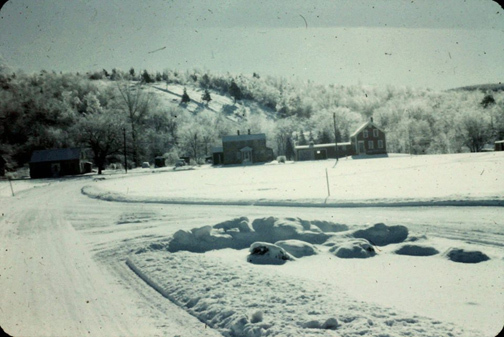 Anonymous: In W. Newbury there was a ski area across the street from the high school. I entered the base lodge as a teen many years ago. It was fairly steep with a single rope tow. This was located right on the Groveland-W. Newbury town line. This is not Big Red, as I skied that in the 70's. This area had closed in the 50's? It was located directly in back of the Old Hales Dog House. I talked to someone at work whose family owned a hotdog stand in front of the closed ski area across from Pentucket Regional HS. The name of the ski area was Break Hill. There is an ice cream stand where the hot dog stand was, the house to the right of the stand has half of the base lodge built into it. The contractors cut the base lodge in half then moved the half probably about 400 ft to its present location right on Rt. 113 . right on a pond next to the ice cream stand. Malcolm Leigh: The the funny thing about Break Hill is I lived right next to the High school and our living room picture window faced the hill. I spent many hours scanning the hill with my binoculars through the window. 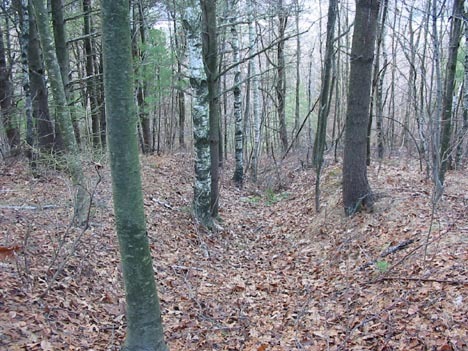 I was intrigued with a white pine forest that covered a large area of the hill. I also remember the water tower and fished in the pond next to the Hale's Hot Dog stand which had the best curly French fries. We did most of our ice skating on the pond between the junior and high school buildings, as it was closer to our house and we did not have to cross 113. Even in the early to mid sixty's there was not much evidence of the ski area, at least from a distance. The old summit lift wheel. Still painted yellow even after all these years.